Every credit card bill displays the total balance due, and the 'Minimum Payment Due'. You have three options - pay the entire balance in full, pay the minimum as stated on the statement or make a manual payment for another amount. But, what you don't pay off will incur interest charges, and selecting the 'minimum payment due' is a very expensive option. In this guide, we present every bank's minimum payment terms, what to watch out for and ways to avoid sky-high credit card interest costs. When you get your credit card bill, you'll have the choice to pay the entire balance due, pay the Minimum Payment or make a payment of another amount. Whatever balance due that remains unpaid will be charged interest immediately after the due date. With credit card interest rates averaging around 20% p.a, NOT paying off a credit card in full is a very expensive option in the short and long term. If you haven't paid a credit card in full, you'll see an 'interest charges' item on your next credit card bill. Until your original balance is completely paid off, you will continue to see (and pay) interest charges. Balance transfer credit cards become a popular alternative if the debt gets too much. It's important that we highlight how banks offer different 'minimum payments' as a percentage of your bill. If you can't pay the balance in full and choose the minimum balance option, it's important to know what the percentage is and how it affects your debt. In summary, the lower the minimum payment percentage, the less the amount of your balance that will clear, and the longer you'll be in debt. If you have a $1,000 credit card bill with a minimum payment of 2%, and you pay the minimum, you'll pay $20 on the day the card balance is due. If your credit card has an interest rate of 20%, you will incur around $16 of interest (20% X $980)/12 months. Your next bill will be $996 ($980 current balance + $16 interest). The next month, your minimum payment will (mostly) go towards interest charges and not the $996 balance you owe. Disturbingly, it will take 16 years to repay the $1,000 - and you'll pay over $2,000 in interest costs on top of the original bill. Minimum payments can trap you into debt unless you increase the amount you repay. 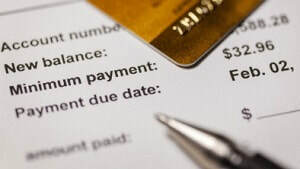 If you have a credit card debt of $5,000 and rely on making minimum payments, the following examples show the actual cost of the debt, and how long it will take you to pay it off for a number of popular low-interest credit cards available today. Our credit card minimum payment calculator shows you exactly how long it will take to pay off a credit card. *Despite the same interest rate and minimum payment percentage, BNZ's minimum payment of $25 or 2% (vs Westpac's $5) forces quicker payment. 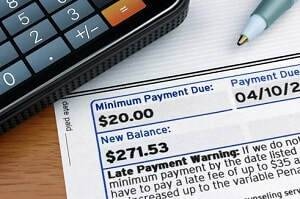 As these examples demonstrate, the actual cost of only making the minimum payment is significant, and the lower the percentage of minimum payment required, the longer the debt will linger. Only get a credit card if you can afford to pay it off each month. If you can't do this, but need it as a way to meet your bills and other necessary expenses, keep the limit as low as possible, so there's less chance of using the credit card for non-essentials.